Finding Moon by Tony Hillerman is a nice little piece of fluff and just what I needed after the heavy reading from Kathy Escobar, and the anticipation of Winner Take All Politics by Jacob Hacker and Paul Pierson. I think I had read it when it first came out, but I didn’t remember the story at all. I was a little disappointed to learn that it wasn’t about his Indian characters, rather it was about the end of the War in Vietnam. It was interesting, but, as I said, not heavy. I just finished Down We Go by Kathy Escobar. It’s a totally compelling read about following Jesus into the downwardly mobile life that was taught in the Gospels. It is based on the Beatitudes and the 12 Step programs that teach us a new way of living. I would love to think I had the courage to follow – I know I’m going to try. I started reading it because it was recommended as a companion book for the Presbyterian Women’s study of the Beatitudes this year. I feel like it really made an impression on me. I hope it sticks. Another good read by Lee Child is The Affair. This takes us back to the beginning of Jack Reacher’s wanderings by telling us why and how he left the Army. The plot was a little thin, compared to most of Child’s work, and it seemed like he was hurrying to get it finished – I hope so he could move on to the next book in the series! I’m FINALLY finished with The Lake Shore Limited, by Sue Miller. From the name, I thought this might be a bit of a travelogue with an interesting look at people you meet on the train, or something. Anyway, it was certainly NOT that. It was kind of a boring look at three or four very uninteresting people, who happened to come together because of a play, written by one of them with the name “The Lake Shore Limited.” I WISH I had given myself permission to stop reading long before I got to the end, but I kept on because I thought, surely, something interesting is going to happen. It never did. I finished What’s the Matter with Kansas: How Conservatives Won the Heart of America by Thomas Frank. I got it in an attempt to understand why people seem to be willing to vote against their own pocketbooks. This is a well-thought out, thought-provoking book that I heartily recommend to anyone else who is struggling with the whole idea of the apparent death of liberalism, and the dichotomy of the “Christian” right and real Christian values. I finished Diary of a Mad Fat Girl by Stephanie McAfee. It was a nice little piece of fluff – a quick read, and fairly interesting, but far from intellectually stimulating! For some reason, Barnes & Nobles doesn’t even have this listed as a Nookbook, even though I bought it from them and read it on the Nook. Go figure! 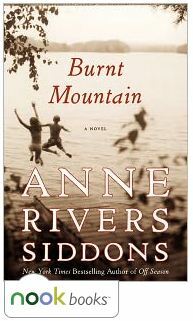 I polished off Anne Rivers Siddons’ most recent book, Burnt Mountain. This was quintessential Siddons – a combination of dreams and reality, and utterly readable from start to finish. There’s nothing deep or earthshaking about this book, but it’s a great summer read! As always, the author grabs you from the beginning and leads you through her reality, that, in the end, is also your reality, but in between you find you have visited a world of madness and magic. Well, I’m finished with the whole series with the end of The Land of Painted Caves, by Jean Auel. There was an awful lot of repeating and “catching us up on the story so far.” The actual story could have been told, and told well, in about 200 pages instead of 715. That said, I did stay up until VERY late last night finishing it (about 2 hours past my regular bedtime). The Shelters of Stone has been completed. The fifth in the Earth’s Children series by Jean Auel was very interesting as Jondalar and Ayla finally finished their long journey and arrived at his ancestral home. Most of the book was taken up with Ayla becoming familiar with the people Jondalar knew. They travel to a Summer Meeting, and she meets folks from many of the other caves nearby. Zelandoni, the spiritual leader of the 9th cave begins to convince Ayla to join the ranks of Those Who Serve the Mother, and though she resists, we know she will eventually take her place in the ranks of the Zelandonia. I finally finished the Plains of Passage. This book by Jean Auel, the fourth in the Earth’s Children series, is the longest to date, and also the most tedious. There are pages and pages and chapters and chapters of information about the flora and fauna of the prehistoric time, but very little about the people, although we do get a chance to revisit the Sharamadoi and the Landzandoni, and are introduced to a group of “wicked” Amazon warrior-types. The book concludes as Ayla and Jondalar return to Jondalar’s home. Jean Auel’s The Mammoth Hunters is behind me again. This is probably my least favorite of the books in the Earth Children series, mostly because Jondalar behaves like such an unmitigated jackass through the whole book. I had forgotten how irritated I became at him and his self-centered thoughts. (Now do you see what happened? I’m all angry again just thinking about it.) Nevertheless, the research into the living conditions and tools of these primitive people is extraordinary. As usual, I’ve learned something, accidentally, while following a pretty good story. I finished The Valley of Horses, the second in Jean Auel’s Earth’s Children series. It was interesting as we were introduced to Jondalar. The first three-quarters of the book deals with Ayla and Jondalar separately, but by the end, they have met and begun their love affair. This is probably my favorite of the books I have read in the series, but I don’t remember much about several of them. I just finished The Clan of the Cave Bear for about the fifth time. I read it when it first came out in 1984, and then I’ve reread it every time Jean Auel has published another book – so I could be sure I had the back story straight. I think the last time I read it was almost 10 years ago. It was just as good this time, and I found I saw things I hadn’t remembered from the first time I read it. I’ve just completed Mothers and Other Liars by Amy Bourret. It’s a fairly predictable little story enlivened by legal suspense and interesting settings. The characters are likable, and fit the location of Santa Fe very well. I probably wouldn’t have read it, except that Amy is a member of our church and I was interested to see how well she did as a first-time author. I’m finished with Without Fail, #6 in the Jack Reacher series by Lee Child. I’ll give it a big thumbs up for creativity and minimal violence. (You may remember I’m not too fond of a lot of the violence is these books.) I was glad to have read #8, the Enemy, first, even though it comes after this one. Jack’s history is explained in that one, so it really helped to know about his brother, and who he was. I finally finished Nudge – Awakening Each Other to the God Who’s Already There. I read it as an assignment for a training at church. We are having the author, Leonard Sweet, to do a workshop on Saturday (I just finished it in time). Unfortunately, the author seems to be afflicted with the problem that many preachers have – he says the same thing over and over again. I could have reduced the book to fewer than 20 pages and still covered all of his main points. But, hey, who would pay $20 for a 20 page book. There were two or three good points, but there was an awful lot of dreck to wade through to get to the good stuff. At least now I can get back to reading my mind-rot! The Pioneer Woman – Black Heels to Tractor Wheels – A Love Story is now a part of my history. Ree Drummond, aka The Pioneer Woman, told the story of her courtship and first year of marriage to Marlboro Man. It’s a fun, steamy romance-novel type of book, with the added inducement that it is autobiography. I first became acquainted with Ree on her blog, and I’m an ardent fan. I’ve turned my daughter-in-law, cousin, and several friends on to her site, and they all love it. So much so, that my daughter-in-law has threatened me with sudden death if I don’t get Ree’s autograph when she comes to Dallas for a book signing. I would like to have one for myself, but, alas, there’s no way to sign a Nook. I finished reading Echo Burning, #5 in the Jack Reacher series. It was a little slower to start out. In fact I had a hard time keeping up with it until the last 75 or 100 pages, and then it got pretty good. There’s not nearly as much violence in it as there usually is these books, and I suppose I like that better. I finished Jay Bakker’s Fall to Grace. There wasn’t anything particularly startling in it, but it was very affirming of my own ideas about Grace. It’s largely an analysis of Galatians, and reiterates Jay’s agreement with Paul that Grace is the key to Christianity. There is a pretty good chapter with arguments against the prevailing notion of homosexuality being a sin. Again, it comes down in full agreement with me, so, of course I liked it. I just finished Running Blind (Jack Reacher Series #4). It was probably one of the best of the series so far – very little violence and lots of thinking and figuring out. Parenthetically – I was wrong in my post “It’s Cold, Cold, Cold, Cold, Cold” when I said it had something to do with ICE. The first book I read in 2011 was Pursuader (Jack Reacher Series #7). Actually I started it in 2010, and I finished it this year. It was pretty good, certainly not the best in the series. It probably suffered from my familiarity with the character. There was neither as much violence, nor as much humanity as in the others I have read. Jack seemed a little flat.